“Everything went well so we were too relaxed, hence the error on the throw at the end. The program was not difficult to learn, but to repeat and improve. Before we used to be focused only on the elements, but now we want to skate more like dancers, it took time to put everything together. But we are pretty happy with the first competition. Our (Level) 3s is from the spread eagle. The triple toes are from different entrances between us. Last year, we were focusing on the quad and it took a lot of energy so we didn’t have the time to focus on these transitions, but now we are more confident on the elements. The choreographic step is quite hard, it’s almost like a real lift because Morgan has all the weight on one arm. We also have an outside spread eagle that we think they’ve never seen before, it’s dangerous as it’s harder to catch the girl with your weight back, We like to create new things. With the new judging system, it is not worth the risk having the quad. 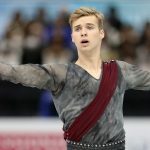 We needed it in the past when we were stronger technically and we were improving our skating skills and transitions. We needed something different than everyone else. Now it’s not worth the energy and the reward is less. They also changed the rules for a level 4 lift. There is not so much variety of what you can do before a lift. For example, everyone is going to do a lunge before a backward lasso. At the moment, we haven’t found something interesting enough to put in the program yet, but we will work on it. Our goals for today were mental. We have practiced it, but never competed the long for an audience this season. So the goal was to see how we deal with the program under pressure. Morgan skates faster when he’s stressed and Vanessa skates slower, so we learnt to adapt to each other. It went better than we expected. 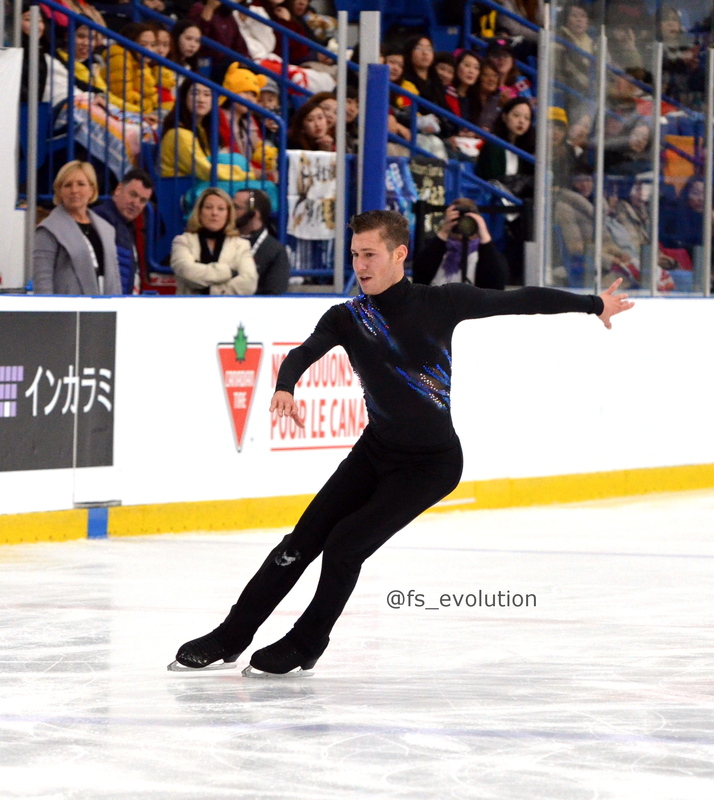 “It was a pretty good skate for a first competition. The first time is always a bit shaky, a little tight, but we are on a good way. Our elements were good, except the back outside edge death spiral. We know it’s our weakness and we want to improve to get higher levels. We are trying to be different from the other teams with our elements, for example, by having a short preparation for the toe-loop right in the middle of the ice. After that, we do choreography, then pattern into the spin, lift, everything has to be timed perfectly with the music. The positioning of the throw is on the music high. We have gotten consistent so when it’s going to be great, we hope to get a high GOE. We have to work hard to keep in time with the music and not having to rush. There’s no room for error in this program. We have more confidence this year, but we know that we don’t pay enough attention to the details and give often few points away here and there on the levels. “This is our first competition of the season. We haven’t competed in a while and we were thinking a bit too hard. We made some little mistakes, but this is a jog before the run. We are working on the twist to get high level and GOE’s. “I had a bit of a rough warm up, so I’m glad I came back with the program. I’m overall happy, although, there are some improvements. I’ve always loved this music. It’s a very mature piece, a tragic story, so there was a lot to do there with interpretation and choreography. I had a friend in intermediate who skated to it. I loved it then and I love it now. Last year, I was the princess. This year, I am the queen. Benoit Richaud is the choreographer. He’s a joy to work with–fun. He always brings a new challenge. The spins at the end are very musical to match the music and hit the accents. The accents are very obvious, so I felt it was important to accentuate them and help the PCS. After I land the salchow and go down on one knee, I call this the Ironman pose after the first Avenger movie when Ironman makes his entrance like that. Winning will help my confidence, but I didn’t focus on my competitors here, only on myself and what I can control on the ice. There are good days and bad days in practice, but what I showed in the competition is what I practice. “I skated like I’ve been practicing, so I’m happy with that. My hopes for the season are doing my best, exactly how I’ve been training and like tonight. I’ve been working really hard on the components and that’s one of my goals for the season, to draw the audience into my performance, make more of a connection. My choreographer Benoit Richaud is helping me with that. For example, he reminds me to look up and to focus on some other details like body movements. I’ve worked with him twice so far. He’s great. He has his own style and he always has new challenges for me. The music is called “Rebirth” and that’s my goal for the new season. I’m trying to change my skating. 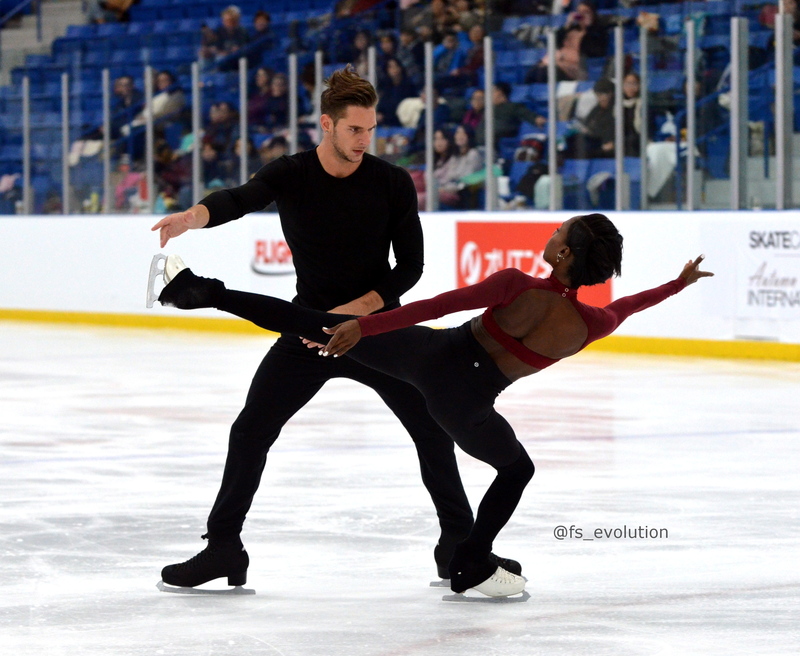 Benoit choreographed both programs and picking the music is a collaborative effort. There are no words to express what last season meant to me. It was a whirlwind and a rollercoaster and I still get chills when I think about it. I have come to this season with new goals and a new style and I’m ready for that. 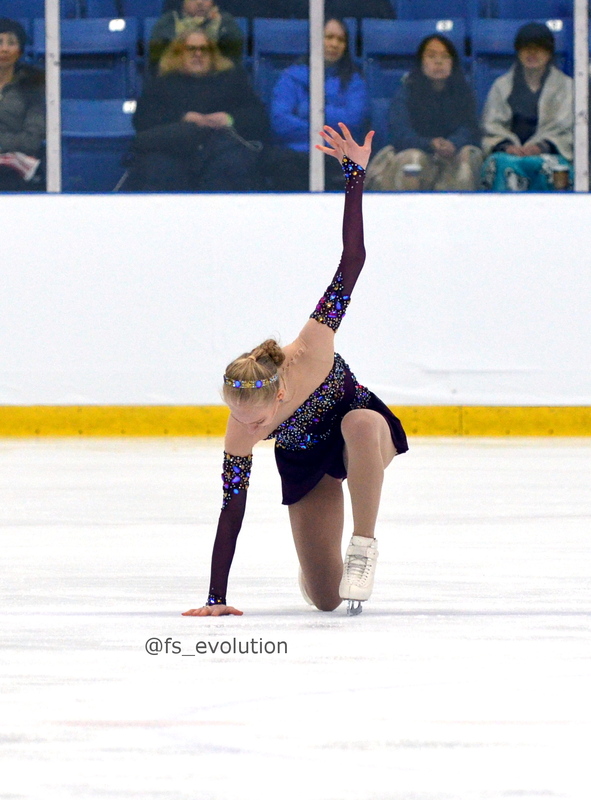 I had the triple Lutz-triple loop last year already. I like better the loop than the toe. It’s a fun challenge and I’m excited for people to see it. To design my costumes, my mom and I and my dress designer sit at the table and take ideas from various dresses that I like and mix them all together. “To be honest, I feel amazing. This competition was an incredible experience for me. It’s the first competition with (my) new team, new everything, I made lots of mistakes, which we will fix, but I feel good and I feel I can do this clean. I only made one huge mistake at the end. I have more than a month to improve it. I can’t wait to start working again and more and more, the whole team is ready to work. In Canada, I learned to be happier here as a person. Everyone is so polite and you always feel in a good mood and mentally ready to work. I always wanted to skate to Libertango. It’s still hard and a fast rhythm for me. At the end, when you are tired, you still want to show fire. 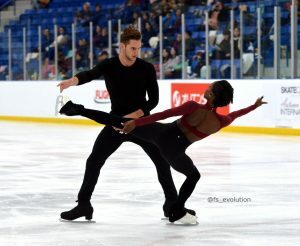 It will take time, but I’m sure everything will be fine by Skate Canada. 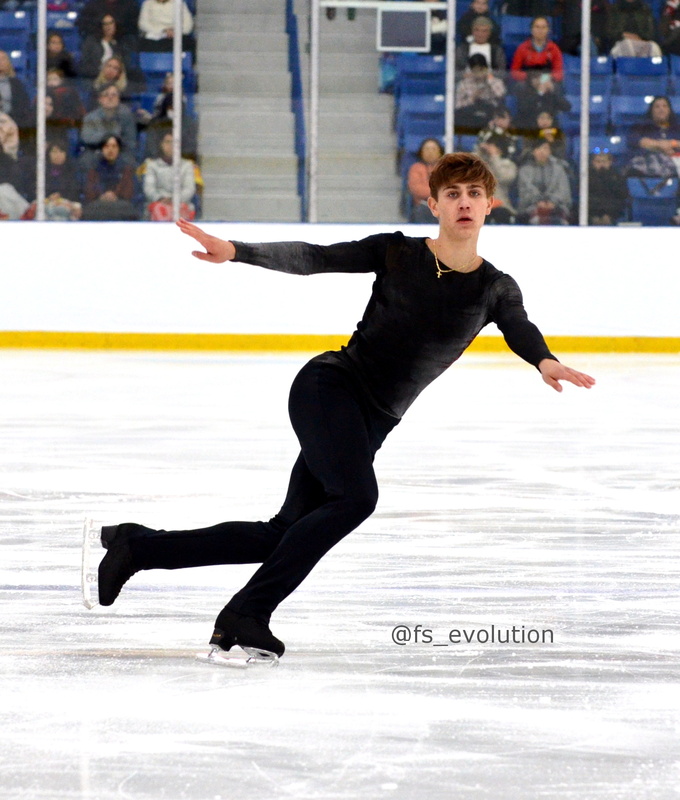 “In competition, I’m trying to calm down and skate like I train. I like skating with the group at the (Toronto) Cricket Club, we do stroking and jump together, they give me energy and we work really hard, it helps all of us. This year, my goals are not to be injured, be healthy, keep training hard. We had a dance class in summer camp–hip-hop. It was a fun time with the other skaters. This was the first time competing after nationals, I was nervous but I thinks it went well. I’m happy with the score given that I made mistakes so I have room to score higher, the axel has been such a struggle for me for years, but finally this year it’s coming along well in practice, so I would like to show it in competition. 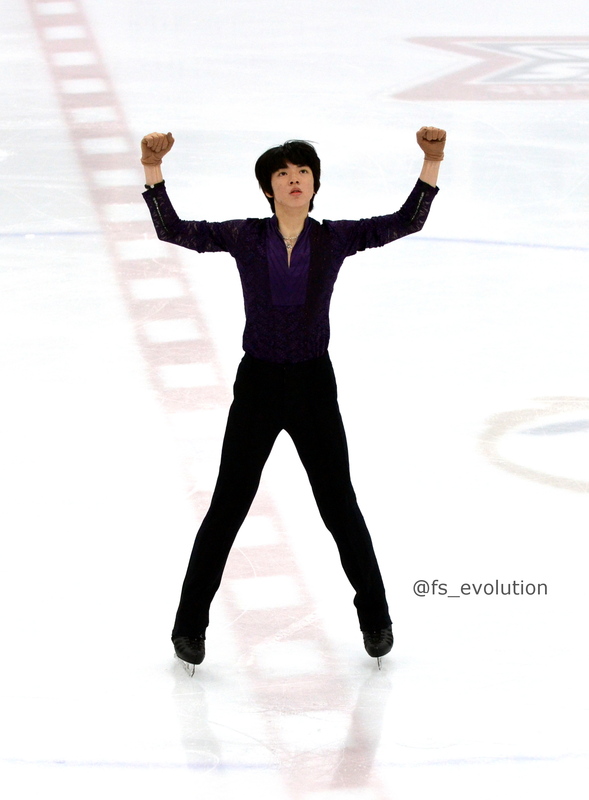 The salchow is my favorite jump. I have settled into my new height, I stopped growing and filled out, I gained weight in muscles and feel more comfortable, more athletic. It’s hard to try to find a balance between jumps and transitions. David Wilson choreographed the SP, Mark Pillay did the free. I added some variations to the spins, to get high levels and GOEs. “It felt good competing. It was the first time I had an international to start the season. I’m proud I kept fighting through it. Each step of the way, I had to concentrate and maximize all the points. I got winded before the combo, but fought through and kept going, trying to work on where to put the focus. Training at the (Toronto) Cricket Club is unbelievable. I can’t speak more highly of Brian (Orser), Tracy (Wilson), Karen (Preston), Lee (Barkell), the whole team. They are patient with me. They worked methodically. It’s a four years project starting from the ground up. They help me work through everything, whether that’s mental or physical. The skaters at the club are supportive, motivating. I picked the Cricket Club because I wanted to make a change and work with a team that I didn’t know personally before. I want a fresh start. People to look at me with fresh eyes. I am very intrinsically motivated and I don’t need other athletes to push me when I’m training. I’m already giving 100%. What’s cool at the Cricket is the pace of the session, you are watching and learning, you have to be alert. So many people doing quads is the norm, and to have such a high level norm is inspiring and becomes what you should expect. I’m working daily on the quad. 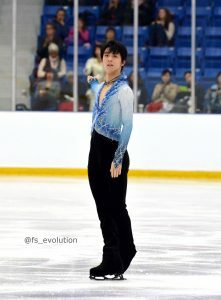 The most impressive thing about Yuzuru (Hanyu) is his focus, his determination. He can fall on a jump, but get up and move on and land something like nothing happened. I didn’t know Evgenia (Medvedeva) very well before, but it has been so much fun getting to know her. I picked her and mom up at the airport and helped them settle down with phone, apartment, internet, etc. Rohene (Ward) did my short program. My sister brought this song from a yoga class. 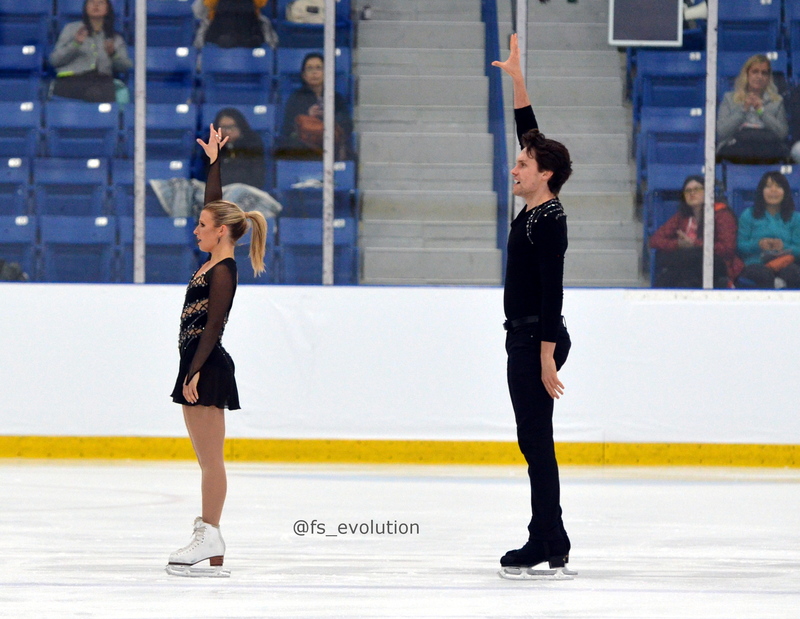 It was a joke based on the names of my other programs, “Scent of Love” (2015-16, 2016-17 season free skate) and “Inner Love” (2017-2018 season free skate), and this is “Love is a B****”, so I could laugh at it in my head. After listening to the piece, I thought Rohene would do a cool job with it, so I called him. Fun fact: Oakville was just ranked #1 best place to live in Canada. 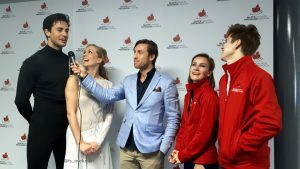 Meagan Duhamel was in the audience Thursday and Friday to watch the pairs. She’s a real skating fan! Many fans were stopping to talk to her and take photos or brought her presents. She’s looking forward to starting the thank you Canada Tour rehearsals right after Autumn Classic. Dylan Moscovitch was at the competition in a new role of doing funny interviews backstage – with his acting background he was very entertaining! Fans dedication: people were sleeping outside the entrance for three days to get the best seats, someone even brought a camping tent. The loudest screams were heard during the warm ups when Hanyu took off his team jacket to reveal his costumes. 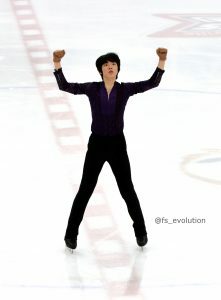 In the FS there was such a rain of Pooh that Yuzuru himself had to pick up a lot of them. Evgenia Medvedeva and Wakaba Higuchi were sitting together chatting and cheering during the men event. At the medal ceremony for the ladies event, it was announced that it was Meite’s birthday, so Tennell and Medvedeva warmly congratulated her on the podium.